Yes, this is Bella. Her latest obsession is the outside world! She LONGS to go outside and play and explore, but the vet has said she shouldn't go outside until she has been 'fixed.' Poor Bella. Here she is clinging onto the screen in our bedroom, although she has been known to crawl up our entire 6ft tall screen door in the front. She is still absolutely adorable and so very affectionate. We continue to enjoy her company. We love having visitors! 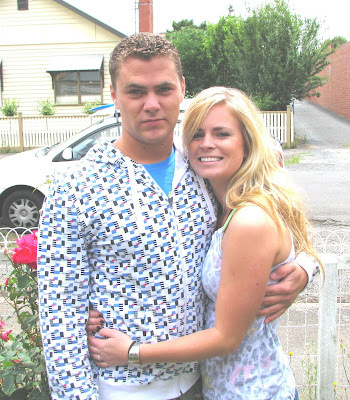 Our latest ones were Murray Hone and his girlfriend Sarah. They are both Canadians. Mark knew Murray from Green Bay, a Christian camp they worked at for many years together during University. Murray came out for an Australian adventure and was working at a youth hostel in Sydney for a few months before Sarah came out and joined him. And finally, I love putting things in perspective... this is the road I bike every day, twice a day, on my way to and from work. I find it peaceful and refreshing. In the last few weeks since I took this photo, the leaves have begun to fall! Autumn is here. I'm still enjoying biking everywhere. It takes Mark and I only 10 minutes each one-way to get to our workplaces. Not bad. This past weekend was a 3-day weekend, out Labour Day. Mark and I seized the opportunity and went camping in Wilson's Promontory, a National Park on a peninsula east of Melbourne. We camped next to the beach and drifted to sleep listening to the waves crash (one of my favourite things!). Over the weekend we went hiking, snorkeling, layed on the beach, sat around a campfire, cuddled in the dark and observed an amazing sky full of stars and shooting stars and just had a nice time together. Photos of this to come in the next blog! Mark's job is still going very well, thanks for all of your prayers. He has picked up the new technique and is becoming an expert in no time. He is pleased with all of the excellent results he receives from it, and his boss is happy with him! I had an interview last week for Starbuck's Assistant Manager position. The interview was OK overall, but when I think back on it I really gave some abstract and goofy answers in my attempt to be honest and quick in answering. Oh well. I'll find out soon if I get a second interview. The twist in this scenario is that a school I submitted my resume to a few months back recently gave me call. The principal said he was interested in meeting me. The school is a Christian K-12 school. When I was speaking with the principal in our meeting, he told me that my name just kept coming to his mind and that he had to meet me. He seemed to be a man led by the Spirit, and it was suprisingly great talking to him. We had a good conversation, and I was excited to learn about how he is a man of vision and has great vision for his school. He wants me to join. Now, he couldn't offer me a set job or contract, mostly because I'm not qualified to teach in Australia, but he did offer me the opportunity to Relief (Substitute) Teach and act as an Art Consultant with the Art Teachers and Yr 11 & 12 students (he is hoping to utilize my worldwide art experiences to enrich their art department). So, your prayers would be appreciated for me!